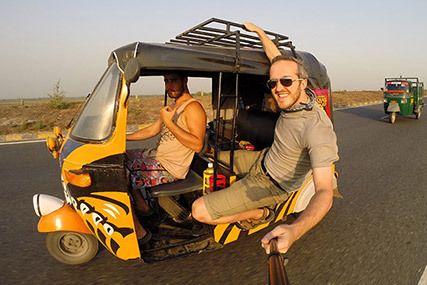 I started this site in 2008-2009 for my first big foray into world travel/rallying, which got me into the current predicament of not being able to stop doing such crazy trips. Latest updates are available at my personal site, scottbrills.com, so head there to stay up-to-date with my latest adventures. You can also follow me on Twitter and Instagram, for those of you that dig that stuff. 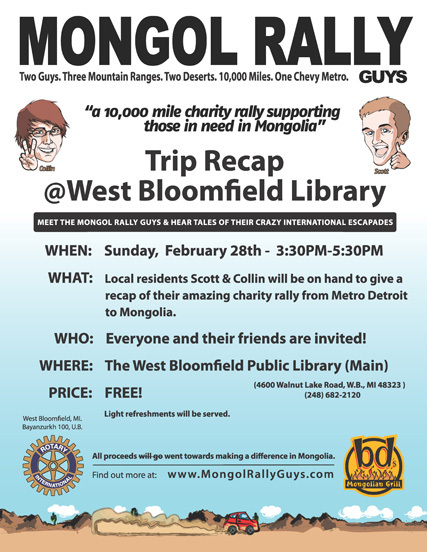 Collin and Scott will be on hand at the West Bloomfield Public Library (main branch, West Bloomfield Township, Michigan) on February 28th at 3:30PM to talk about their trip and give a slideshow presentation of what they experienced. It’s free to attend and everyone is invited, so if you can make it down please come! Light refreshments will be served. Featured in the Oakland Press on February 21st, 2010. We were interviewed by Prague-based American reporter Kristin Deasy at the Mongol Rally Launch Party held at Klenova Castle in the Czech Republic on the 20th of July, 2009. Here’s a link to the full article on the Radio Free Europe/Liberty Radio web site. 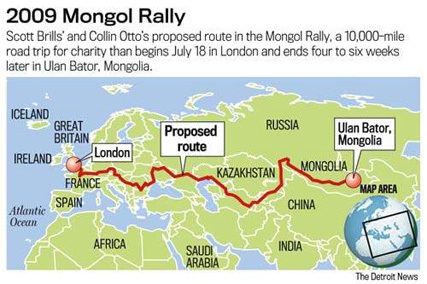 Scott recently wrote an article on the Mongol Rally for Matador Network, an web site geared toward travelers. Read his submission here. We’re in the news again! 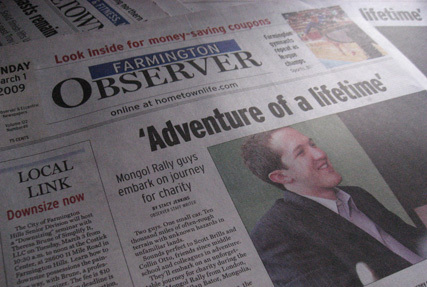 This time it’s the March 11th edition of the Farmington Press. 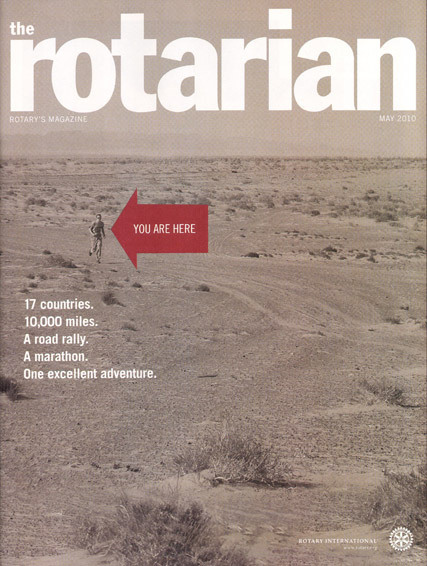 Thanks to Mr. David Wallace for taking the time to interview us. We’ve just had our first article in a local newspaper, the Farmington Observer, West Bloomfield Eccentric, and other local papers owned by Gannett Publishing. Head on over to read the entire article (update: the article is unfortunately no longer available online). Thanks to reporter Stacy Jenkins and photographer Lawrence McKee for taking the time to interview us and help get the word out!